When you see the phrase “native advertising,” what do you think? Do you think of content marketing? Well, a lot of people do … so much so, that I felt compelled to write an article about it. 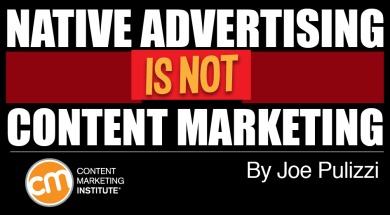 Yes, I am personally vested in the term content marketing, but the important thing is that we have universal agreement on whatever term we, as an industry, have collectively decided to use. Now that we have this, we can continue to build our industry, warts and all, together. For those same reasons it’s important to understand how other industry terms are related to content marketing. A few years ago, the term native advertising caught on (more on its meaning in a second). Too many marketers and agency executives erroneously use content marketing and native advertising interchangeably. When that happens, our industry takes a step backward, as native advertising is simply one way marketers can distribute content. The point is that using the correct terminology is important. To me, to you, to the industry. If we can’t speak the language fluently, how can we expect others to understand content marketing or respect us as content marketers? Content marketing is a strategic marketing technique of creating and distributing valuable, relevant, and consistent content to attract and acquire a clearly defined audience – with the objective of driving profitable customer action by changing or enhancing consumer behavior. Content marketing is an ongoing process that is best integrated into an overall marketing strategy. It focuses on owning media, not renting it. In content marketing, the brand owns the media. It’s an asset. I’ve written a thorough overview of native advertising on LinkedIn, but let’s look at one example. A directly paid opportunity – Native advertising is “pay to play.” Brands pay for the placement of content on platforms outside of their own media. Usually information based – The content is useful, interesting, and highly targeted to a specific audience. In all likelihood, it’s not a traditional advertisement directly promoting the company’s product or service. This is where native advertising looks a bit like content marketing. The information is usually highly targeted (hopefully) and positioned as valuable. But again, in native advertising, you are renting someone else’s content distribution platform (just like advertising), except that you aren’t pimping a product or service. Delivered in stream. The user experience is not disrupted with native advertising because it is delivered in a way that does not impede the user’s normal behavior in that particular channel. Brands want their native advertising to look as similar as possible to the third-party site’s content. Though the media company wants that too (because it’s easier to sell that way), it also has to put out a multitude of warning labels around the content to make sure the paid placement is 100% transparent. To summarize, native advertising doesn’t disrupt the user experience and offers helpful information in a format similar to the other content on the site so users engage with it more than they would with, say, a banner ad. (This is good for advertisers, and if the content is truly useful, good for consumers.) In very simple terms, native advertising is one way content marketers can distribute their content. If you pay for placement, it’s advertising. If you pay for placement of valuable, relevant content in a format similar to the third-party site, it’s native advertising. If you don’t pay for placement, the content is not advertising. If that content is valuable and relevant, designed to attract a clearly defined audience, and posted on your own or other unpaid platform, it’s content marketing. Now, this doesn’t mean you shouldn’t pay to promote your content as part of your content marketing strategy. If you don’t have an audience that is subscribed to receive your content, you should look into paid media as a way to reach a targeted audience. The next time someone uses content marketing or native advertising in the wrong scenario, please correct the person. Help us all speak the same language and be part of positive change for the world. Should You Buy or Grow a Pineapple for Your Audience? The Interactive Advertising Bureau breaks native advertising into six categories. Check it out here. What tactics are successful content marketers relying on most? Find out where your peers are focusing their content marketing efforts in our eBook: Building the Perfect Content Marketing Mix: Top Priorities for 2015.